Growing Potatoes In Containers is great fun. 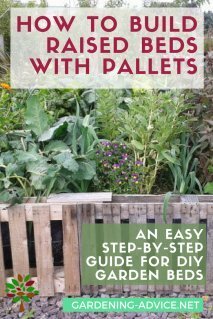 This simple way of growing potatoes can be done on the patio, on balconies or backyard. You don't need a garden to do this. Harvest loads of delicious tubers from a potato planter. Growing potatoes in pots has loads of advantages. You don't have to dig, worry about soil-borne pests and harvesting is easy. 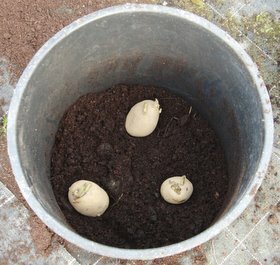 You can grow potatoes in pots even if you don't have much of a garden. Have you ever tasted a potato that was just dug before you cooked it? Trust me...once you have done that you want more! And you can have that even without owning a garden by simply planting a few in pots. 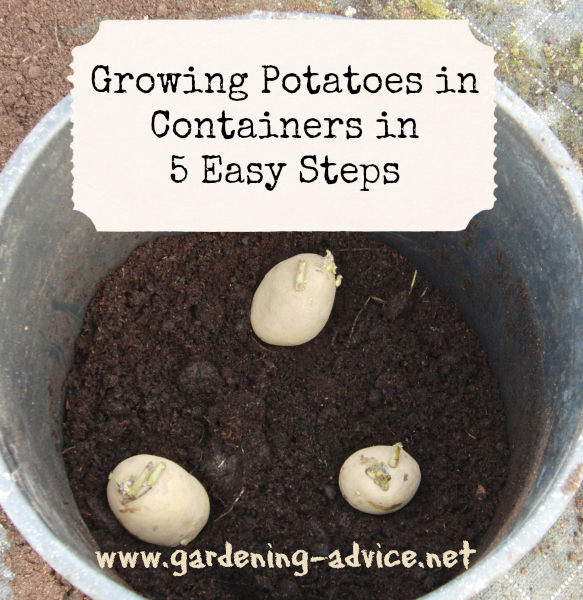 Instead of throwing those sprouting potatoes under your sink away just plant them into a bucket or plant pot. This works really well with early varieties and if you want super early potatoes try growing them in a conservatory or a glasshouse. 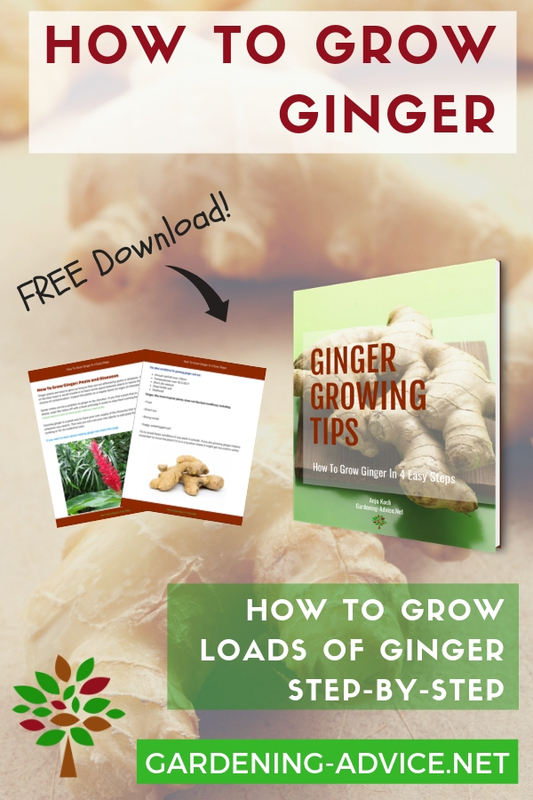 Enter your email for a FREE cheat sheet! 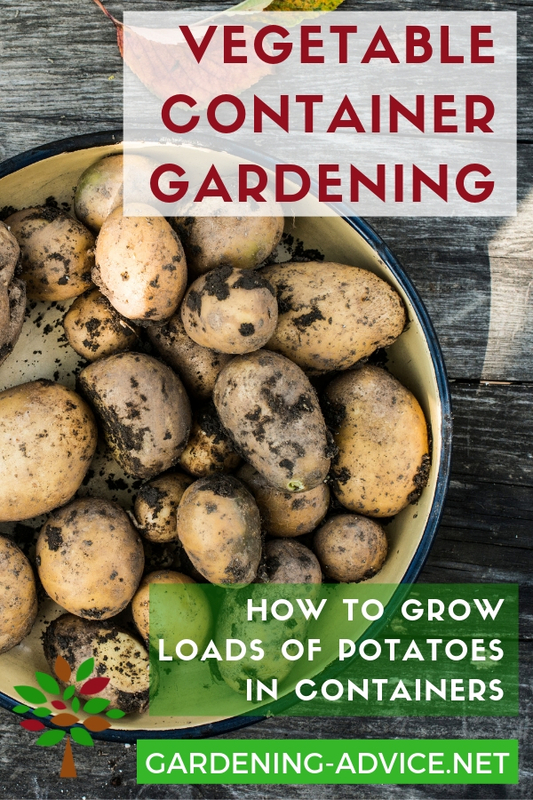 Just follow these simple steps and harvest loads of potatoes just from pots. Containers: plain plastic pots do the trick. The minimum pot size is 12 inches diameter and minimum 15 inches deep. Make sure they have drainage holes at the bottom. You can also use these handy potato planters that will allow you to grow even more potatoes in a small space. 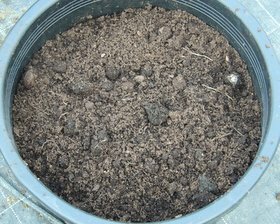 Potting soil: Get a good quality potting compost. I prefer to mix it with well rotten farmyard manure because potatoes like a lot of organic matter in the soil. 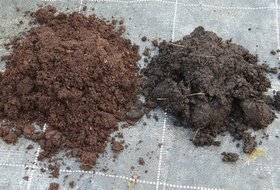 A mix of 50% potting soil and 50% farmyard manure works very well. Organic fertilizer: Add a couple of handful organic fertilizer into each pot. This will ensure healthy and vigorous plant growth and a good crop. Feed again after five or six weeks. 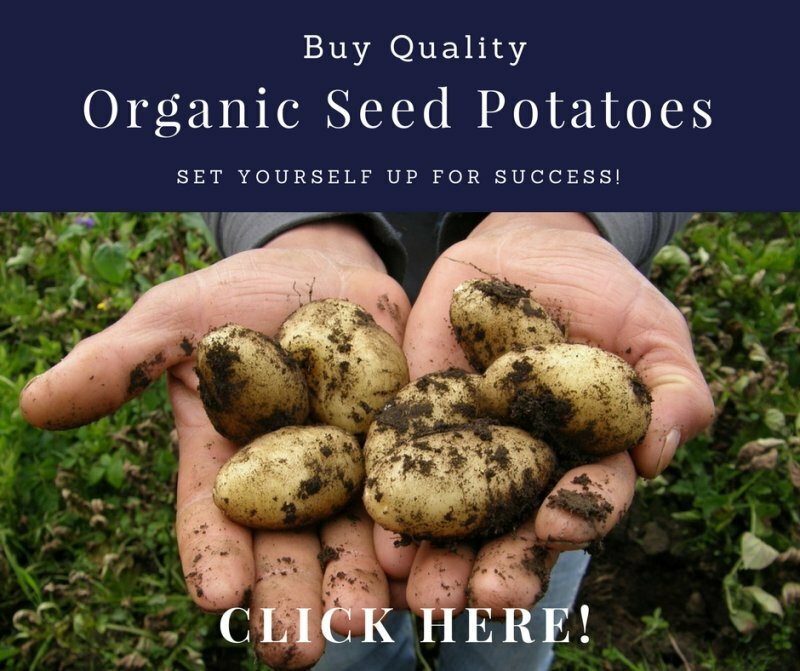 Seed Potatoes: Get healthy and good quality seed potatoes . Chit (sprout) the potatoes for a couple of weeks in a bright spot. Egg cartons are very useful for this purpose. Step1: Prepare your soil mix. I prefer to use a half and half mix of potting soil and farmyard manure. Good garden centers will stock pre-packed farmyard manure. 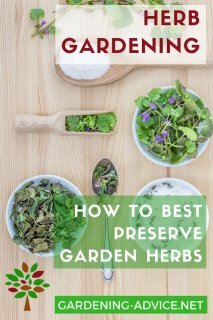 Alternatively use an organic potting soil mix. Step 2: Fill the pot with the potting mix about 3-4 inches high. Depending on pot size put in 3-5 seed potatoes. Step 3: Cover them with the potting soil and manure mixture. Add a couple of handful organic fertilizer and mix it well into the soil. Don't fill the pot up to the top yet. Leave 3-4 inches to the rim of the pot. Water them in well and keep the soil slightly moist all the time (not wet!). Step 4: Once your potatoes have grown to about an inch over the rim fill the pot up with more potting soil. This will prevent the new potatoes on top from going green. Step 5: Now...watch your potato plants grow! Make sure that they don't dry out. Regular watering is a must. Add a bit more of the organic fertilizer after five or six weeks. Once the plants are flowering your potatoes are ready! They are at their absolute best if you harvest them just before you want to cook them! I would choose a variety that produces a medium-sized to small potatoes for containers. A shorter maturation time is also preferable for pots. Nearly all early or second-early varieties should be good. They are smaller than maincrop potatoes and mature faster. This is a very elegant way of growing potatoes in containers. 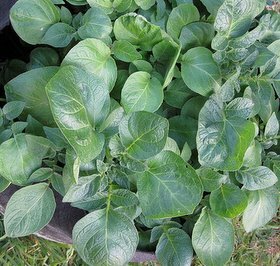 You can produce a bumper crop of delicious potatoes on less than a square yard! These sturdy fabric potato bags have velcro on the side and can be opened on the side. This will allow you to carefully harvest just the potatoes you need keeping the other ones fresh and growing! The fabric is air and water permeable. This allows a process that is called air-pruning. The roots will spread out much better than in ordinary plastic pots resulting in healthier plants and better crops. Fill the planter with 6 inches of the potting-manure mixture and plant your seed potatoes about 2 inches deep. 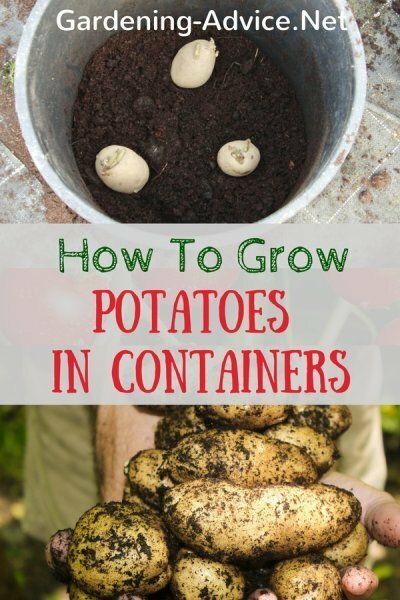 Once they are about six inches tall fill in more soil and plant some more potatoes on top. Cover them with 2 inches of soil again. Repeat this process until the potato planter is full. Don't forget to add some organic fertilizer with every layer. Once your plants flower it is time to check for the first potatoes! Open the velcro at the side of the planter. Remove the ones that are large enough and enjoy your first crop! These sturdy potato planters are reusable and can be folded for storage. 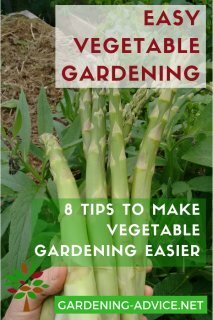 They can of course also be used to grow other vegetables or plants. See...growing potatoes in containers is great fun!